I can count on one hand the number of funny bits in Madagascar. All of them, in a much better film, would have been minor gags, tossed off by the writers to fill space between moments of hilarity. But in this unfunny movie with a depressing premise and an unsolvable conflict, even the most minor chuckle shines like a diamond. The movie is the latest from DreamWorks animation, the good people who brought to life an ogre and a sassy donkey. Now we have a sassy zebra named Marty (voiced by Chris Rock) and a lion named Alex (Ben Stiller). 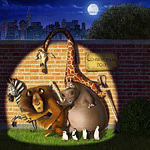 There’s also a hypochondriac giraffe named Melman (David Schwimmer), and a Hippo called Gloria (Jada Pinkett Smith). These four animals, along with some erudite monkeys and some saboteur penguins, live in the zoo in Central Park. The animals are charming in their own way because they are a little dumb. They are voiced by savvy humans, but the characters are naive and dependent. It’s pretty adorable in its own way, and it makes the characters sympathetic. Unfortunately, our sympathy for these critters is a liability for Madagascar. We soon see them in all sorts of perilous and degrading situations, and the more we care for them, the less funny these situations are. Alex the Lion wows the throngs of New Yorkers by striking bodybuilding poses (somehow, I thought New Yorkers would be more jaded and harder to please). So anyway, he gives Marty an Alex the Lion snow globe for his birthday, but Marty is not cheered by the gesture. Marty is depressed because he lives in a zoo and has no freedom (not the funniest premise for a children’s comedy). He walks on a treadmill facing a mural of the savanna where he belongs, which is really depressing. The penguins too feel out of place and work diligently, but not very concertedly, to escape. Marty decides to get out of here and see “the wild,” which he thinks is upstate, accessible via the train. To make a long story short, it all goes wrong, but Marty and his friends leave anyway, having been turned out by the zoo for their strange behavior (yet another depressing development). Tranquilized, crated, and placed on a cargo ship (hilarious, no? ), they make their “escape.” The laughs keep coming as the crates fall overboard in a storm and our naive, dependent heroes face death by drowning, inside tiny, lonely crates, in the twenty-foot swells of an ocean storm. Eventually our heroes are washed ashore on a remote island off the coast of Africa, where a lemur king named Julian (Sacha Baron Cohen, of Ali G fame) presides over primate raves (yes, the dancing monkeys count as a joke, and no, it’s not that funny). The film’s ultimate conflict is whether the zoo-softened animals can cut it in the wild, hopefully with the help of the party lemurs. But Madagascar is so hopelessly gone that fixing some of the problems wouldn’t make a better movie, just one that’s inconsistent and unfunny in some slightly different way. Chris Rock and Ben Stiller are funny men, but restrained by the movie’s PG rating, and working as a zebra and a lion, respectively, they have nowhere to go, they have no room to maneuver. Their comic personae have nothing to do with the roles they are given. If anyone in the cast gets to be funny it’s Cohen, sporting an Indian accent and trying to keep everyone dancing all the time. But generally, the movie’s sense of humor just isn’t funny. The musical cues are all ironical gags. When the animals wash ashore, we get ten seconds of surf music. When the zebra struts around loose in New York, we get ten seconds of Saturday Night Fever’s “strut” theme. Running on the beach? Ten seconds of Chariots of Fire. Even in Looney Tunes cartoons, the literal musical cues were setups, and not the jokes themselves. Most of the “grownup” jokes are arbitrary references to pop culture. “Spalding” the castaway basketball almost makes sense, but Irish step dancing? Are jokes about that still funny? Didn’t that fad pass a decade ago? And how old do you have to be to get the reference to Planet of the Apes? Or how about the original Twilight Zone? Maybe these references will get a laugh of recognition for the older adults, but there’s really nothing inherently funny about them in a movie about starving, lost zoo animals. There isn’t a really good laugh in the entire, interminable, 80-minute running time of Madagascar. It’s not that the movie isn’t well crafted, but there’s no substance under the computer-generated animation. And the animation isn’t even ground-breaking or visually fantastic enough to counterbalance the weak script. Take, for example, the perfect setup for animators to go wild (so to speak). Our zoo heroes get hit with tranquilizer darts and the movie goes into a trippy point-of-view fantasy. So what do the animators dream up? A ten-second long, three-shot sequence that shows normal reality as though through a kaleidoscope. I personally know two cartoonists who could have come up with something better using their home computers. Madagascar is not completely awful, but it has very little going for it. The best reason to see it is to deconstruct how you can take a perfectly formatted film with a big budget and all the correct elements, and still end up with a dud.